Turkish rabbinical author; born at Smyrna 1788; died there 1869; maternal grandson of Joseph b. Ḥayyim Hazan, author of "Ḥiḳre Leb"; pupil of Isaac Gategno, author of "Bet Yiẓḥaḳ." After serving as president of the tribunal in his native city, he was appointed ḥakambashi there in 1854. His declining years were saddened by his deposition, although he was reinstated and held the position until the year before his death, and by disturbances among the people. He was held in great veneration by the masses; and at his funeral the hearse was escorted by a battalion of troops—an honor which has been shown by the Turkish authorities to two or three chief rabbis only. Ḥayyim Palaggi (MaHaRḤaF) was a very prolific writer. Not counting twenty-six manuscripts which were lost in a fire, and a large number which are unpublished, he produced twenty-six works, most of them containing in their titles his name, Ḥayyim. They are as follows: "Darke Ḥayyim 'al Pirḳe Abot" (Smyrna, 1821), commentary on the Pirḳe Abot; "Leb Ḥayyim" (vol. 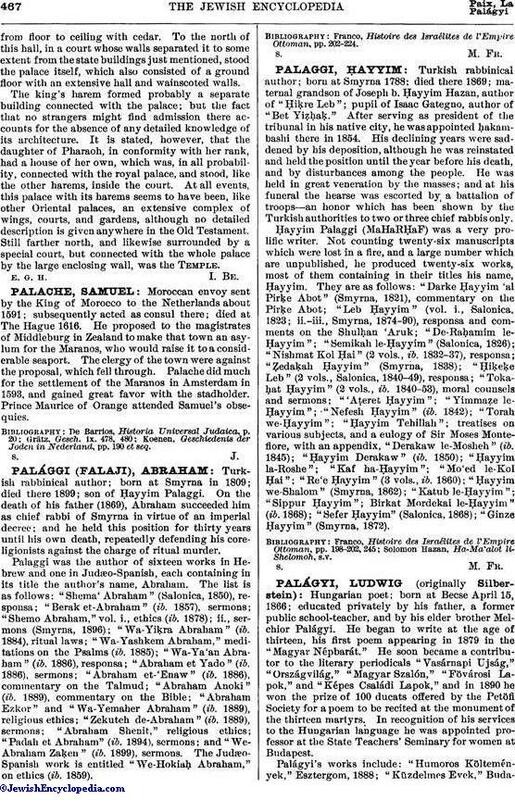 i, Salonica, 1823; ii.-iii., Smyrna, 1874-90), responsa and comments on the Shulḥan 'Aruk; "De-Raḥamim le-Ḥayyim"; "Semikah le-Ḥayyim" (Salonica, 1826); "Nishmat Kol Ḥai" (2 vols., ib. 1832-37), responsa; "Ẓedaḳah Ḥayyim" (Smyrna, 1838); "Ḥiḳeḳe Leb" (2 vols., Salonica, 1840-49), responsa; "Toka-ḥat Ḥayyim" (2 vols., ib. 1840-53), moral counsels and sermons; "'Aṭeret Ḥayyim"; "Yimmaẓe le-Ḥayyim"; "Nefesh Ḥayyim" (ib. 1842); "Torah we-Ḥayyim"; "Ḥayyim Tehillah"; treatises on various subjects, and a eulogy of Sir Moses Montefiore, with an appendix, "Derakaw le-Mosheh" (ib. 1845); "Ḥayyim Derakaw" (ib. 1850); "Ḥayyim la-Roshe"; "Kaf ha-Ḥayyim"; "Mo'ed le-Kol Ḥai"; "Re'e Ḥayyim" (3 vols., ib. 1860); "Ḥayyim we-Shalom" (Smyrna, 1862); "Katub le-Ḥayyim"; "Sippur Ḥayyim"; Birkat Mordekai le-Ḥayyim" (ib. 1868); "Sefer Ḥayyim" (Salonica, 1868); "Ginze Ḥayyim" (Smyrna, 1872). Solomon Hazan, Ha-Ma'alot li-Shelomoh, s.v.